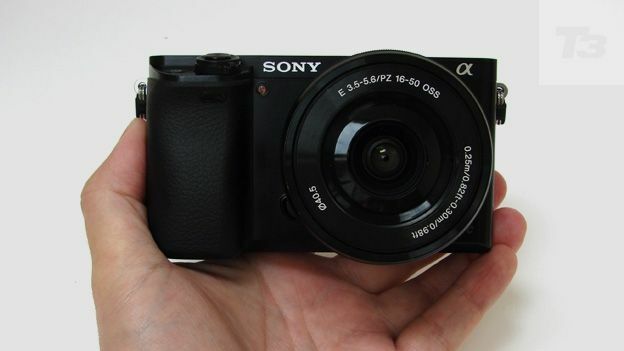 Following the maker's 'world's smallest and lightest' compact system camera in the Sony A5000, comes its slightly bigger brother in the Sony A6000. This time the headline claim is the world's fastest auto focus performance in its class at just 0.06 seconds. This can be attributed in part to inclusion of a latest-generation Bionz X processor, as found in the £1,000 Sony A7 models, plus a 'best of both worlds' hybrid AF system that mixes a huge 179 phase detection AF points with 25 contrast detection AF points. The palm-sized contender adds the bonus of a built-in viewfinder for anyone preferring to hold the camera up to one eye when shooting, making the A6000 a successor in all but name to the older Sony NEX-6 and Sony NEX-7 models. Thankfully, even with self-retracting mechanised 16-50mm Power Zoom lens attached, camera and lens will still squeeze into a roomy jacket pocket. In short, if you're not put off by the blocky industrial-looking design this Alpha series offers, the A6000 could be a good option for your next semi-professional travel camera, particularly if you don't want to lug a digital SLR around. Unsurprisingly it also includes NFC and Wi-Fi connectivity for sharing pictures and video on the go, and offers compatibility with Sony's burgeoning PlayMemories camera apps. The DSLR comparison is not just due to the viewfinder, ramped up operational speed, nor the fact that light sensitivity maxes out at ISO25600 for shooting in the dim; but also because the A5000, like the NEX and A models before it, incorporates a DSLR-sized APS-C sensor. In offering a sizeable 24.3 megapixel effective resolution (up from the A5000's 20.1MP), this pits Sony's A6000 directly against the equally modernistic Samsung NX3000, the Canon EOS M, plus Fuji X cameras in respect of the larger than average chip size. Further alternative interchangeable lens cameras with slightly smaller sensors include Panasonic Lumix G, Olympus Pen and OM-D models, plus Nikon's one-inch sensor '1' system. With suggested pricing from £549, which is more affordable than the NEX-7 ever was, does the A6000 indicate a good, solid, value-for-money option for a high(ish)-end travel camera? There are sufficient knobs and nodules on the A6000 to make it appear less minimalist than its predecessors, while buttons for auto exposure lock and a dedicated means of selecting the likes of ISO speed are what wed more commonly be used to finding on a digital SLR. Something that we don't often find on a compact system camera is a nicely rounded handgrip with space for three fingers. We get that here and it ensures the camera sits well in the hand - the thumb coming into contact with the shooting mode and command dials at the rear, while our forefinger hovers conveniently over the shutter release. Unsurprisingly for an enthusiast-targeted model, the A6000 provides a collection of shooting modes ranged around a familiar bottle top style dial, which here is set into the top plate. Its ridged edge protrudes at the back, allowing it to be conveniently spun by the thumb. On this dial we get program, aperture priority, shutter priority and manual shooting models plus dedicated video and panoramic shooting options, along with scene modes and two fully automatic settings - the Superior Auto function automatically tweaking images in camera according to its built-in presets, as a kind of in-camera Photoshop. The camera will even automatically crop an image if it deems the composition could be better, saving the 2nd file alongside the first. In playback mode the command wheel on the top plate and scroll wheel at the back provide two options for how we zoom through captured images or menu settings; on the whole it all feels really intuitive and you'll be whizzing through options without really thinking how you're arriving at your chosen destination. Added to this, with seven buttons being customisable, if you do want to make the camera truly your own there is certainly the opportunity. Since the A6000 shoots 3:2 ratio images as its default setting, this is reflected in a slightly narrower screen than for those cameras that go with the more conventional 4:3 digital image option. Still, the LCD is the regular 3 inches in size and features a semi-pro resolution of 921,600 which is plenty clear enough. Oddly though, we don't get a touch screen facility on this model when surely it was crying out for one. Unlike the A5000, on the A6000 the screen isn't particularly selfie-friendly either, in that it cannot be flipped up to face whatever is in front of the lens. It more conventionally tilts upwards or downwards about its axis, but it cannot be flipped outwards from the body like a camcorder, nor rotated to face screen-inwards to the camera back. Still, a degree of flexibility that allows the monitor to be angled upwards through 90 degrees and downwards by 45 degrees is better than a totally fixed screen. Plus of course there's the additional electronic viewfinder (EVF) located top left of the backplate, rather than positioned centrally. We actually prefer the left-hand positioning as it means our nose isn't constantly smudged up against the larger screen below when we press our right eye against it. The OLED EVF with hefty 1,440,000 dots resolution also features a nifty eye sensor built in, so as we come closer to it, it automatically switches on and deactivates the larger 3-inch monitor. Aperture, shutter speed, ISO and exposure settings are also displayed in the EVF, so you have the essentials in front of you at all times. While a one-inch viewfinder is larger than most we find on compact cameras, it still feels small in comparison to a DSLR proper. So it's largely a matter of taste as regards whether you prefer composing images via the EVF on the A6000 rather than the more obvious angle adjustable screen below, the latter relaying a larger format image for slightly better clarity. A maximum 360 shots from a full charge of its lithium-ion battery falls short of its lower priced A5000 sibling's better than average 420 shots, but is still very respectable, considering that it is also occasionally powering an EVF. Incidentally, Sony quotes a lower 310 shots if primarily using the EVF for shooting, whereas if you rely on the larger LCD for operation this is extended to the full maximum 360. It's also worth mentioning the battery here is charged in camera via the combination of the USB cable and a suitably compatible mains plug; there is no standalone mains charger supplied. We prefer the latter option as it provides the opportunity to be using a spare battery in the camera while another is left charging. Here the A6000 is out of action when you need to charge the spent cell. The two image capture size options here for stills shooting are either 3:2 ratio, which allows the shooting of a full 24 megapixel photograph, or 16:9 widescreen, which effectively is the image cropped, meaning a reduction to 20 megapixels. Naturally, as with the earlier A5000 we are given the ability to shoot maximum quality unprocessed 20.1 megapixel Raw files alongside compressed JPEGs, or both file formats alongside the other, as well as a choice of AVCHD or MPEG4 compression when it comes to video clips. Factor in an APS-C sized sensor, the same size as those found in the majority of consumer digital SLRs, plus a Sony lens and it's already looking like we should have few complaints about image quality. In reality detail is maintained into the corners of the frame and colours straight out of the camera are impressive too, being warm without being unrealistically so. Admittedly we do get a slight fish eye effect and converging verticals - or walls appearing to lean inwards - at maximum wideangle setting, but this is nothing unusual from a jack-of-all-trades kit zoom like the 16-50mm supplied. While the Power Zoom supplied is not completely noise free, it is as we found when using with the A5000 'whisper quiet'. The fact you're not using fingers to make manual adjustments also ensures the body integral stereo microphone on the top plate aren't picking up that movement in quieter locations, as they would if you were making manual adjustments. As we noted when looking at the A5000, an electronically operated zoom comes into its own when shooting video as the transitions between wide angle and telephoto setting - or vice versa - are much smoother than many of us would admit to achieving if we were instead manually twisting the lens barrel. We're being asked to pay £130 more than the A5000 for the privilege of a built-in eye-level viewfinder, differing angle of adjustment on the LCD screen, and a slightly higher pixel count - none of which make a massive difference to the appearance of the images the 24.3 megapixel A6000 produces, though its swift operational speed might help you better capture them in the first place. Deciding between the two Sonys is best achieved by popping down to your local camera seller and examining the siblings side by side. Otherwise, if you dig the EVF facility and post war industrial look of the Alpha series, then this is another 'can't go wrong' purchase.